"I don't believe it!!" Victor Meldrews BMW E63 645Ci with just 11,738 miles. Bi-xenon auto headlamps, LED rear lights, driver, passenger, head and side airbags, HiFi loudspeaker system, sports leather steering wheel, electric memory seats and steering wheel, front and rear PDC, auto climate control, cruise control, info display, remote central locking and boot release, key memory, auto wipers, folding heated mirrors, illuminated vanity mirrors. 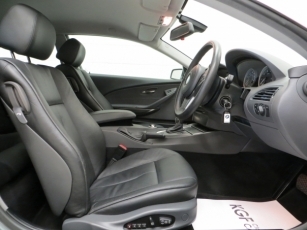 Factory options: Auto gearbox, Professional Navigation, TV function, heated front seats, CD changer, front cup holder. This Gran Turismo flagship BMW model looks stunning finished in metallic Silver Grey, (Code A08). The dynamic lines and sweeping roofline flow beautifully giving the car huge presence. Owing to the incredibly low mileage and cossetted ownership the condition is exemplary. In order to reduce weight and achieve near perfect 50:50 weight distribution the doors and front section are aluminium and the font wings are Thermoplast. Attention to detail can be seen with factory items such as the polished stainless chrome tailpipes and chrome plated windscreen washer jets. Supplying dealer number plates are fitted front and rear and this example will appeal to the perfection seeking BMW enthusiast. Pure luxury is evident with the use of exclusive materials and outstanding workmanship all in as new condition. Finished in Black Dakota Leather, (Code LCSW), with Ruthenium Pearl gloss the beautiful interior architecture complements the exterior harmoniously. All deep pile carpeting has been protected by genuine BMW velour floor mats from new and the boot area along with the rest of the interior is virtually unused. 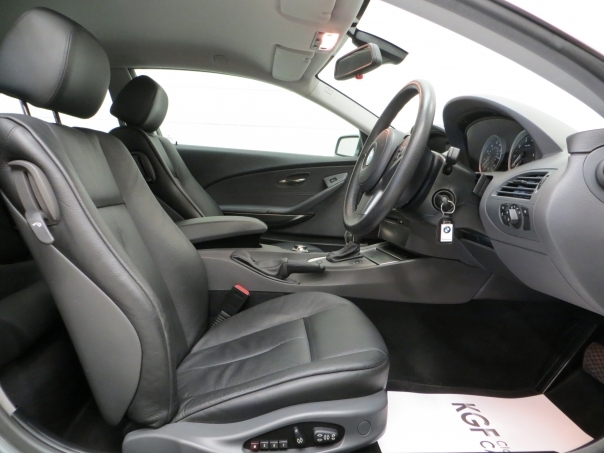 Desirable factory options such as the Professional Navigation, heated seats and a cup holder add to the occasion of an already very highly specified car. All controls function correctly. Outstanding in every respect. The BMW 6 Series V8 engine sets many technological benchmarks and has been impeccably maintained despite only covering 11,758 miles with 16 recorded visits to the main dealer. With 333bhp quoted 0-60mph is despatched in 5.8secs and top speed is electronically limited to 155mph. The engine bay is spotlessly clean and factory perfect. The optional six-speed automatic gearbox enables fast, smooth shifts for excellent driving dynamics and comfort. Optional Double-spoke styling 120 alloy wheels are unmarked and are shod in matching premium Bridgestone Potenza 245/45 R18 front and 275/40 R18 rear tyres. The high performance brakes with aluminium floating calipers and generously-sized light weight inner vented brake discs guarantee top levels of braking safety. Supplied new by BMW Main Dealer Chiswick West London on the 30th April 2004 to Richard Wilson OBE the Scottish Actor, Theatre Director and Broadcaster. Well known for his Victor Meldrew character in the BBC sitcom One Foot in the Grave. Parting with £54,205 excluding on the road charges he remained the owner before selling to a good friend and only other custonian, Mr Peacock, in September 2015. A fabulous and complete record of history is logged with 16 visits to a BMW main dealer and the last service entry being on the 16th November 2017 when 11,682 miles were covered. All the BMW invoices are included along with a hardcopy print out confirming the date and mileage of each visit. A full set of keys are included, all handbooks and a sales brochure. Probably one of the best.